I’m in the middle of a 40-day, 16 stop, 14 country tour of the world. These are my experiences. So perhaps my pen will behave. We have just missed a flight to Singapore, and I’m guessing we will be spending our first (unscheduled) night in the airport. Seems like a good time to recount the trip so far. We arrived at 4am on an overnight flight from Miami, touched down in Lima, Peru, and disembarked to try to figure out our surroundings. As far as we knew, our next flight was scheduled for that afternoon, leaving us with several hours in which to explore the city. We wanted to get a cab, take it to the historic center, and have a look around before darting back to the airport. I would have preferred to walk, but as I soon realized, airports are not near anything. And as the information desk attendant warned me, this was “coyote territory”. So a cab it was. Around 8am, we decided that we were ready to venture out, and went looking for our driver, to no avail. So we began negotiating with the other drivers. They asked for 50 soles, but I had already figured out that the official rate was 45, so I asked 30, and then accepted their 45 counter-offer. Learning to negotiate. Baby-steps. Off we went, on the craziest ride of my life. I’ve ridden in cars in the middle east, but this was worse. I couldn’t keep my mouth closed, I was so shocked. At every moment, we were squeezing in between two other cars, or between a car and a bus, or around a motorcyclist - or being shoved out of the way by some combination of those things. There was no physical contact, but the whole system operated by threatening as if there would be. There were no lanes, so every driver was trying to squeeze between and around every other driver. Buses came frighteningly close to my face. Finally we pulled clear of rush hour and took off careening down a street that looked like an alleyway, weaving around buses, pedestrians, pushcarts, darting animals, and other drivers. It looked like a car commercial where they try to show just how good their brakes and steering really are. After 20 minutes of this, we made it to the historic center, where we left the driver with instructions to meet us back there at 11am, and he left us with Spanish-language instructions we didn’t understand. Except for the part about rogue taxi drivers who would kidnap us. Or something. So off we went around the beautiful square. Armed police were everywhere, including some with heavily banged up riot shields. Nevertheless, the city seemed friendly. We peered through gates, snapped surreptitious photos of the guards, and tried not to get pick-pocketed. At midmorning, they opened the San Francisco Church catacombs, and we decided to get a quick tour of this place where something like 20,000 bodies were buried. The “combs” themselves were musky and made it hard to breathe. I’m sure the dust of all those bones, which someone had once decided to sort into piles of like kinds - skulls over here, femurs over here, leg bones all in a pile over there - didn’t help. At the end of it, I was having trouble breathing, and we were 10 minutes away from our scheduled cab ride, which left me heaving and coughing as we ran back through the streets towards the center. And there was our cab-driver, waiting for us, looking relieved and thrilled that we had survived. Where someone finally informed us that our flight wasn’t until the next day. Somehow, we had convinced ourselves that we had less than a day in Lima. And we were wrong. And now we had to find a place to spend the night. If this were happening now, I probably would just sleep in the airport. But we decided to get a hostel. Utilizing the airport Starbucks wifi, we found a hostel, booked it online, and proceeded to try to arrange airport pickup. The hostel had advertised airport pickup and English-speaking staff, however, three tense phone calls with them indicated that their ads did not match reality. After they agreed to pick us up and never came, we ended up finding our own transportation. The cab driver did not like our selection. “This is for them, not for you!” he kept telling us, pointing to the neighborhood, the locals, the dogs carelessly hanging off the rooftops. Sure enough, we finally arrived at our hostel - a scary looking building at end of a dirt alley. We began to fruitlessly pound the door for several minutes. When our driver got out and did it for us, we finally got someone to open up. Even though the person who came to the door couldn’t speak English (again, contrary to the ads), we managed to get them to give us a room. We then locked ourselves in that room, and didn’t emerge until morning. We were too afraid - of our hosts, of the neighborhood itself, of all the warnings the locals were giving us. Besides, we really needed to sleep. So we slept, and outside the window, dogs hung off rooftops, pushcart drivers with loudspeakers hawked fruit and the offer to cart off your broken electronics, and some invisible neighbors played Elvis songs on electric guitar until dusk. And then the whole street experienced 30 minutes of intense activity before settling down for the night. I slipped out of my room, up a floor, and onto the open roof, where I could slide between the dry-hanging sheets and look down on the whole thing. If this had been America, I would have been standing in a forbidden area. But in Peru, I wasn’t so sure. 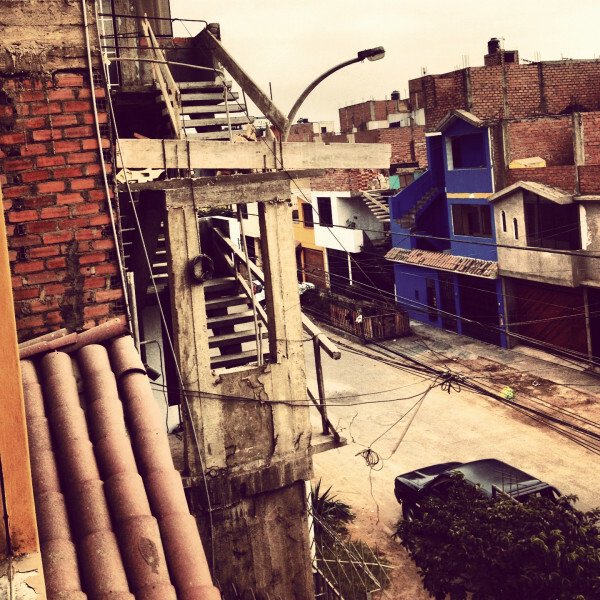 And so I stood there between the sheets and the wall, underneath an old unused billboard, staring out at the neighborhood around me, and the city of Lima beyond it. Well, it sounds like if you survived Peru then you should be able to make it through all the rest of the world. BTW, you adventure in Peru also sounds like the stories we used to hear back in the 70's from naive American college kids who would go to Peru, Columbia & Venezuela "flying blind" ( with no experience ) expecting to get rich smuggling pot or coke. Those who survived unscathed sometimes did, others were just happy to get out alive, others were never heard from again. No cell phones or WiFi back then either. Stay safe ! Against Consumerism What is Technology? The Resurrection is Technological Christianity is Transhumanism What’s up with the word Transhumanist? Three strains of religious transhumanism The argument for basic theism The Structure of Human Hope: speculations on immortality Computer Science and Eternal Life Interested in Christian Transhumanism?